Welcome to the Orthopaedic Research Laboratory (ORL) Nijmegen! 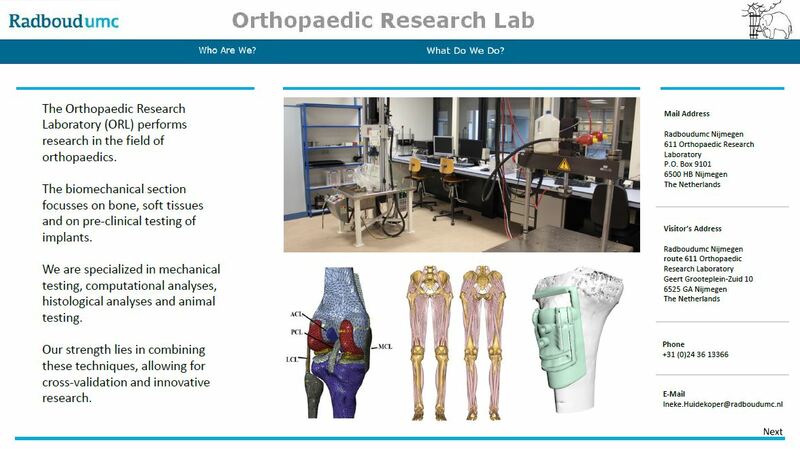 The Orthopaedic Research Laboratory (ORL) performs fundamental and applied research in the field of orthopaedics. Our research focuses on bone, cartilage and meniscus tissue and on pre-clinical testing of implants. We are specialized in mechanical testing, computational analyses, histological analyses and animal testing. Our strength lies in combining these techniques, allowing for cross-validation and innovative research. The lab is run by biomechanical engineer Prof. dr. ir. Nico Verdonschot. As shown by the people’s list, our group is multidisciplinary, with personnel from biological, engineering, movement science and clinical backgrounds. The Orthopaedic Research Laboratory (ORL) performs research to strengthen the scientific basis of Orthopaedics, relative to orthopaedic surgical interventions and reconstructions. The main goal of surgery is to create those physical and biochemical conditions, which allow tissues to heal, maintain and adapt themselves. The goal is to find out how the external loads applied to the musculoskeletal system are transferred to the tissues, and how these tissue loads influence extracellular matrix maintenance, adaptation, revascularization and adaptation of tissues. With respect to bone, the main effort is directed to develop procedures to restore bony defects after failure of hip and knee prostheses using bone impaction grafting. In this line basic research in animal models is combined with clinical, in vitro tests and clinical output studies. The mechanical quality of bone is investigated in relation to fracture risk in osteoporosis and metastatic bone disease. In addition, there are similar projects on soft tissues, such as joint ligaments, articular cartilage and the repair or replacement of a damaged meniscus. Also, we develop laboratory tests and computer simulations to evaluate artificial joints before they reach the patient. These tests allow us to study the effect of implant design and surgical parameters on factors related to implant survival, such as failure of materials, bone adaptation due to changes in periprosthetic loads and micromotions at the interface with the host bone. The ORL is part of the Radboudumc University Medical Centre Nijmegen, department of Orthopaedics. The research of the ORL is part of two clinical relevant research institutes, the Radboud Institute for Molecular Life Sciences (RIMLS) and the Radboud Institute for Health Sciences (RIHS). Both within the Radboud University, and with national and international academic and industrial partners intense cooperations exist in various projects.